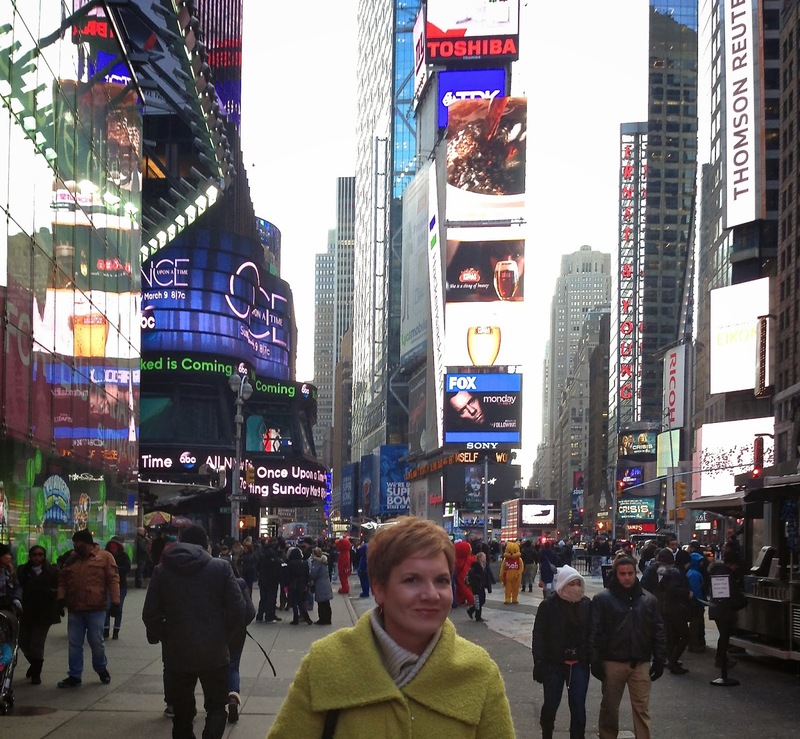 Yes, I'm actually writing this from New York City! 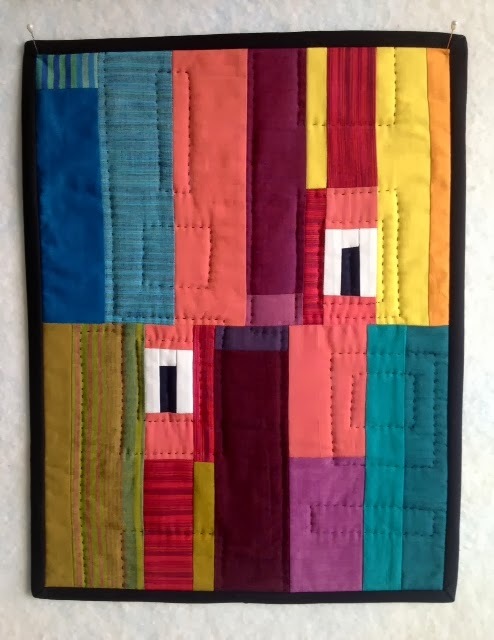 Wouldn't you know, I'm in between exhibits at The Art Quilt Gallery in New York, the only gallery in NYC devoted to contemporary art quilts, but my OKCMQG pals sent these lovely projects to share for February's Flaunt Your Finish! If you don't know the drill, your project must be completed in the current FYF month. If you have a project you finished in February, link up your blog of Flickr page at the end of this post. And if you're not quite sure how to link-up we'll have a How-To at the end of the post as well. Ann completed these two projects (with minutes to spare!) for her daughter-in-law's baby shower. 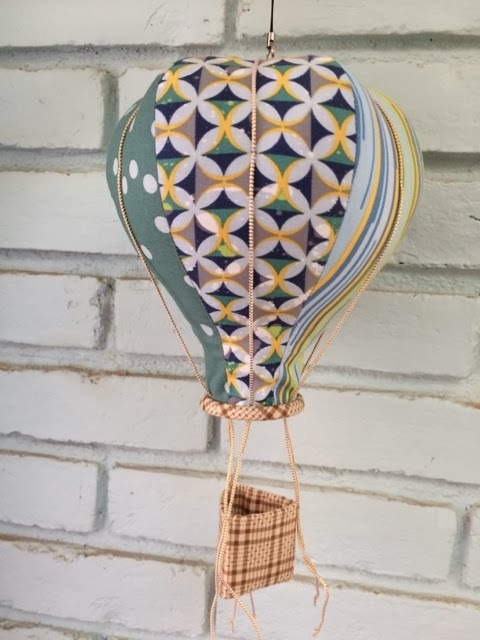 "Their nursery theme is hot air balloons. I had in mind to create a soft sculpture right after I heard that was her preference. Tom helped me with shaping the pattern. The rest I improvised along the way. One of my new favorite lines, Zen Chic Barcelona complements her linens choice. 7" balloon diameter." If you're a Doctor Who fan, hold onto your hats. 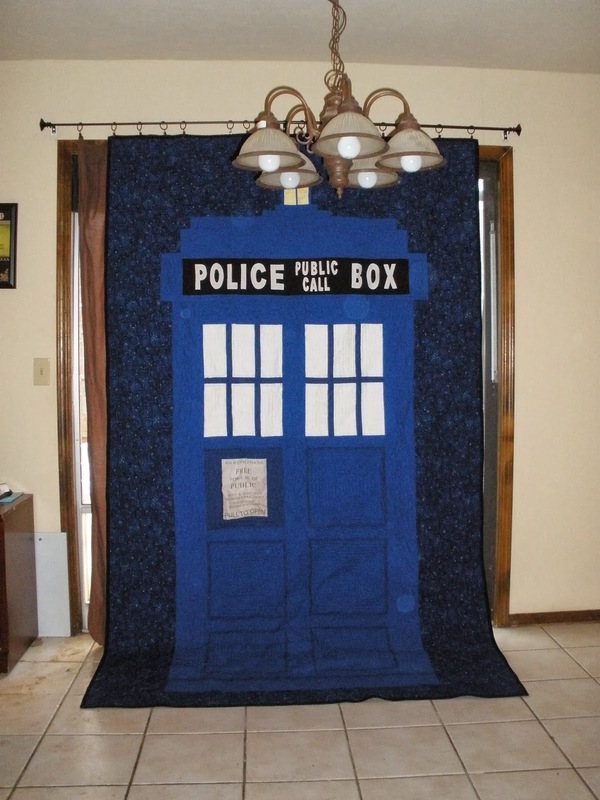 Melissa made this Tardis quilt for her daughter's friend that is getting married in March. 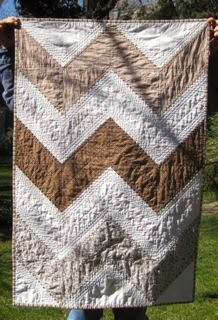 "The engaged couple are both over 6 feet tall, so they really appreciated that the quilt was so LONG! A special shout out to Ann for making the wording block that she printed onto fabric for me :)"
Just returned from Budapest, Agnes' mini is inspired by the luscious spice hues of Kaffe Fassett's shot cottons. "The portals symbolize the opportunities we have in life and our hard decisions on choosing one, or the other." On permanent exhibit at Je's Bend. 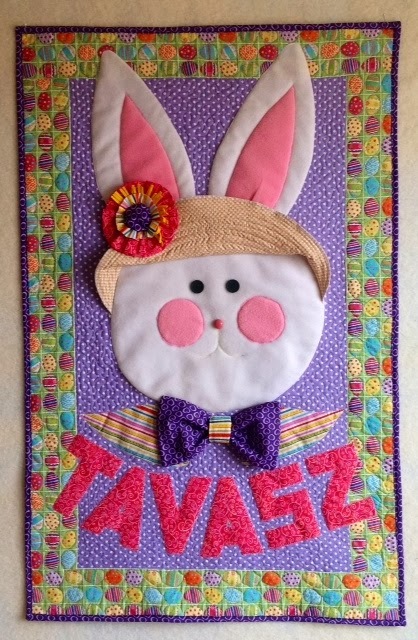 Agnes also designed and made this cute and happy seasonal Easter banner for the home where her mom currently resides in Hungary (hence the Hungarian word for "Spring" on the bottom). Elizabeth made a baby quilt for a baby girl. The dad-to-be has been a friend of her son's since they were babies...."their family is very special to our family. The mom-to-be is decorating the baby's room in brown and white. I am not making a quilt for decoration, I want it to be used. However, I still wanted to try to make something in colors that she would appreciate." Elizabeth used Kona snow (not bright white) and various browns from her stash. The backing is a pop of color from Amy Butler's Love called Sunspots for Rowan. 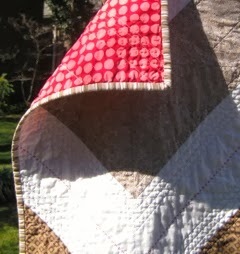 She machine quilted using her walking foot along the zig zags, and added a final touch of fuchsia hand stitching. The quilt measures 33"x 50". Something we all probably need to improve upon...Listen! made by Teresa, was inspired by Victoria Findlay Wolfe’s word challenge last January. 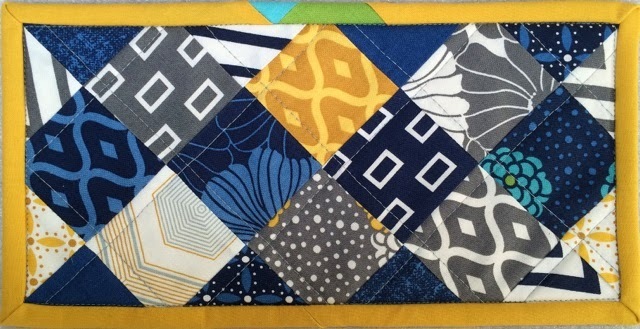 "The mini quilt was created for one of my endorsers to highlight my artistic style and as a thank you -- she chose the word." It is watercolor, and embroidery on quilting cotton. 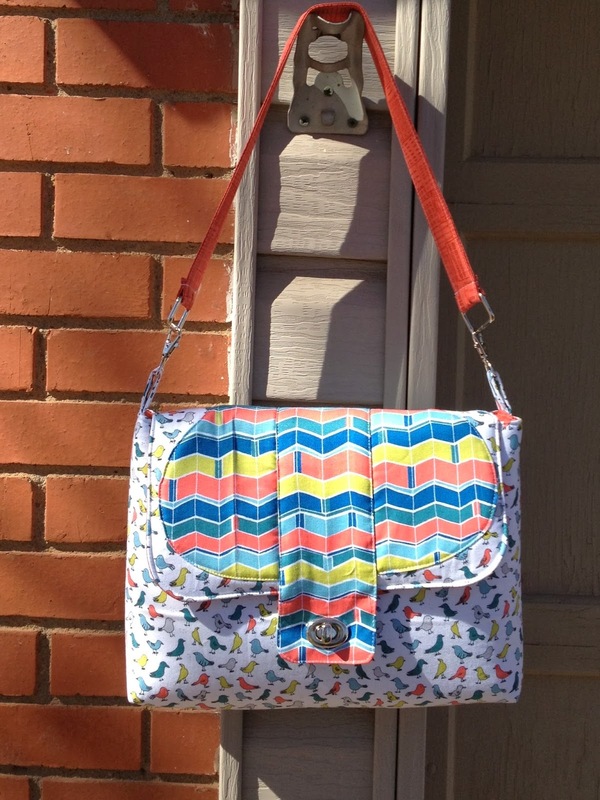 This bag by Angie is part of the Big City Bags Sew Along she's hosting. The pattern is the GoGo Bag from the book Big City Bags by Sara Lawson. Fabrics are VeloCity. "I added an extra pocket and a key clip to the inside to help keep me organized. It was my first time using ByAnnie's Soft & Sable and it is amazing!!" Write a post on your own blog with photos of your project and publish it. Since you are linking up a specific project and not your blog in general, click the title of your post so that the URL (the web address) in your browser is the link to your post and not just to your home page. Highlight the URL and copy. Go to the site and specific post hosting the link up. At the end of the post there will be a link that says something to the effect of: "Click here to enter"..."Link up here"..."Add your project"...etc. Click on that link. A window will appear and depending on how the link is formatted, you may see a variety of options. There will be a spot for your URL. That's the URL that you copied. The direct link to your post. Paste it into the appropriate box. You may also be prompted to enter your name and an email. You'll be asked to choose a photo from your blog. Choose photos from "the web" and your photos will appear. Select and crop as desired. After you're done, your link will appear at the bottom of the post! Thanks for sharing your Finish with us! Grab a Flaunt Your Finish to add to your post and share with others!